DeStilling Still Life (Stilleven Stokerij). Artists Wietske Maas and Nikolaus Gansterer distilled a 17th century Dutch still life as part of KAAP, an international art event for kids in a military defense fortress in Utrecht. Nikolaus Gansterer (Vienna) and Wietske Maas (Amsterdam) set-up a distilling station in one of the underground bunker-fort spaces in a former military bunker. In preparation for the exhibition the artists contacted growers and dealers in the Dutch flower cultivation and trade industries to collect all the flowers assembled together in this painting by 17th century still life painter from Utrecht, Roelant Saverij. This painting is part of the collection of the Centraal Museum in Utrecht. 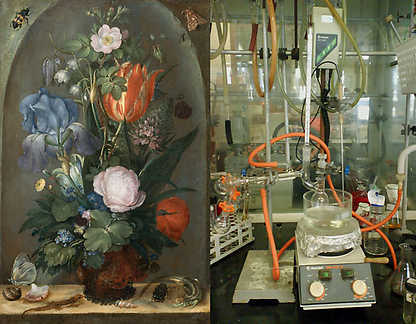 The preperations involved weeks of assembling the laboratory and distillation equipment with a glass blower in Vienna and digging up connections with flower farmers, visiting greenhouses and finding out about the ins and outs of Dutch flora-culture in the Netherlands. As well as flora, there were also insects and a couple of shells and lizards that needed identified and caught with the help of the entomology, conchology and zoology departments at the University of Amsterdam. Instead of plunging vistas, arcades, horizons and the sovereign prospect of the eye, it proposes a much closer space, centered on the body. Hence one of the technical curiosities of the genre, its disinclination to portray the world beyond the far edge of the table. Instead of a zone one finds a blank, vertical wall, sometimes coinciding with a real wall, but no less persuasively it is a virtual wall. . . .That further zone beyond the table’s edge must be surpressed if still life is to create its principal spatial value: nearness. What builds this proximal space is gesture: the gestures of eating. . . . The complete Savery-floral bouquet and entomological ensemble was distilled on May 11 during the opening on the exhibitions and continued to be sniffed and tasted during the days of the exhibition until 22 June 2008. KAAP is an event organised by Stichting Storm, curated by Mark Kremer and features the work of 10 artists from around the globe to engage children’s aesthetic prowess and imaginative curiousity. This entry was posted on Sunday, May 11th, 2008 at 14:50 and is filed under Project posts. You can follow any responses to this entry through the RSS 2.0 feed. Both comments and pings are currently closed.